View The New Farm Trail in a larger map	This driving trail, when taken in its entirety, is about 40 miles long, and is designed to be enjoyed at a leisurely pace. If one stops to enjoy the various sites described in the text, it could take three hours, or more. Some of these sites are best seen as you slowly drive by, while others certainly require a stop, and some delightful walking. A major reason for the creation of this guide is to allow the reader to see some of the remarkable changes that have occurred, and continue to occur in our use of agricultural land in Montgomery County. Nearly the entire route is within the Montgomery County Agricultural Reserve, that 93,000 acre protected area that was created three decades ago to protect some of what then remained of Montgomery County’s rapidly dwindling farm land. As is demonstrated on this driving trail, the goals of that unique example of excellent land planning have, largely, been met. Our trip begins at the intersection of Clarksburg Road and Frederick Road (Md. Rt. 355), just at the western edge of the rapidly growing town of Clarksburg. We will quickly leave the bustle behind, heading west on Frederick Road, towards Hyattstown. After traveling one mile, turn left onto Comus Road. After passing over Interstate 270, there will be an immediate change of pace noticed. Frequently, beef cows can be seen, along with grazing horses. Farms, with barns and hay fields, are interspersed among the homes of small communities fronting the road. Some crop fields are easily seen, most notably as you approach the intersection of Comus Road and Old Hundred Road. At that crossroad, reached after traveling about 3 ½ miles on Comus Road, you will note the well-known Comus Inn, a restaurant and landmark that has served the area for over 40 years. 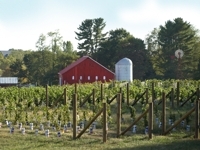 Continuing on Comus Road, while approaching the beautiful Sugarloaf Mountain, after about two miles you will come to a fairly recent addition to the Montgomery County agricultural scene, the 92 acre Sugarloaf Mountain Vineyard (www.smvwinery.com). The farm is owned by the four children of Dan and Polly O’Donoghue, who first purchased the property in 1962. The first grape crop was harvested in the fall of 2005, with the first vintages offered in April, 2006. The immaculately kept vineyards are easily seen from the road, and the eye-catching winery and tasting room difficult to pass without stopping in. This facility is quite popular with local and out of the area visitors alike, not only for wine tasting, but for the large variety of entertainment and festivals sponsored by the winery and listed on their website. Pay particular attention to the Farmer's Market every Saturday 1-4PM (in season) featuring a wide range of locally produced veggies, cheeses, meats, and other delectables. Traveling past the winery, continue the short distance to the Sugarloaf Mountain square, bearing immediately to the left onto Sugarloaf Mountain Road for a short stay. It must be fairly noted the Sugarloaf Mountain is located in Frederick County, and for the briefest of moments, the travelers using this guide leave Montgomery County, quickly to reenter. As you move onward, on both sides of the road please notice the unique concrete fence posts that have reliably held wooden fence rails for generations. Also note that the road changes to Mt. Ephraim Road, while continuing to drive straight. Heading South, about two miles past the square, you will notice a very active farm located on both sides of the road. This complex of homes and agricultural buildings is the Savage Farm. This farm has housed an actively milked dairy herd for at least the past 80 years. 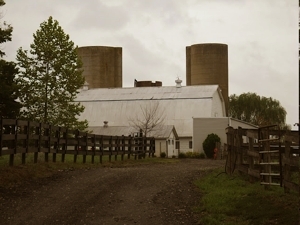 The most notable of the buildings is the dairy barn, on the left. Twice daily, more than 200 cows are milked in this building. The main milking herd, consisting of cows of the Holstein breed (the Black and White cows), can often be seen grazing in the large pasture just past the barn, located in the northeastern corner of the Barnesville Road-Mt. Ephraim Road intersection. Please remember that this farm is not open to the public, so please do not turn onto the farm property. At the stop sign, our travelers have a small choice to make. Our New Farm Trail assumes a left hand turn, but if you travel straight, across MD RT. 28 and travel about 1 ½ miles, you will come to the delightful Monocacy Aqueduct, on the C&O Canal. If you have not previously enjoyed this historic site, it is well worth the few minutes that it would take for a visit. Meanwhile, at the stop sign, turn left onto MD Rt. 28, drive under the railroad bridge, and through the small “up-county” town of Dickerson. Continue for slightly more than one mile, bearing right at the traffic light onto Martinsburg Road. Again, drive a short distance, to where the road curves to the left. At that point, note the entrance signs for the massive Mirant Electric Generating Plant (Pepco), the Montgomery County Composting Facility, and the Montgomery County Resource Recycling Facility. It seems a safe bet that, at the turn of the last century, those farming in this area did not envision these uses of their fields for the future. As you continue down Martinsburg Road, please note the picturesque concrete road that you are on, with beautiful stone walls on either side. This road is included on the roster of rustic and rural roads of Montgomery County, and as a result, will not be altered from this Depression-era delightful design. Also, notice the well-maintained Linden Farm on the right side of the road. This farm is the home of the local Sugarloaf Citizen’s Association, and is used for a variety of public events. Our route, however, continues to the left at the ferry turn-off, with White's Ferry Rd. becoming the gravel River Road. This is the same “River Road” that continues all the way through Seneca, Potomac, and Bethesda, and into Washington, D.C. After traversing a short distance, on the right, you will see the huge flat fields of the J.T. 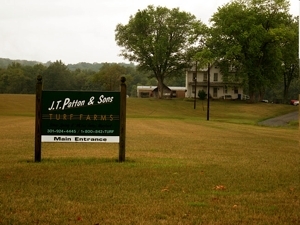 Patton and Sons Turf Farm. This is certainly not a crop that was planted by the farmers of the rich Potomac River bottom land in previous centuries. Sod farming was developed just before World War II, and has become a large farming industry in Montgomery County since that time. There are several family-owned operations located around the county, this being one of the larger. The Patton family began its sod business in 1932. These adjoining farms, comprising some 650 acres of usable farm land, can produce one crop of sod during each good growing year. According to members of the Patton family, sod is considered an 18 month crop, but when growing conditions are ideal, a crop can be harvested about nine to twelve months after planting. The sod is used in new housing developments, on existing lawns, on golf courses, and on other venues. During harvesting times, numerous flat bed trucks can be seen in the area, delivering freshly cut sections of sod to its new location. Continue along River Road, about three miles past the sod farm, bearing left onto Elmer School Road. Soon, you will note the National Institutes of Health Animal Center, on the right. 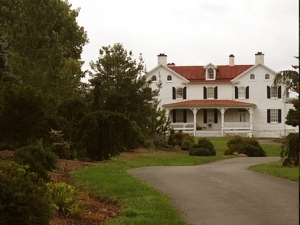 In less than one mile, on the left, you will see the entrance to Potomac Riverside Farm, operated by the Slaysman family. For many years, this was a dairy farm. The main milking barn is still a highlight of the buildings on the converted farm, and the former milk tank room has been renovated as the tack room. This 400 acre farm offers horse boarding, riding lessons and is the host farm for a number of horse shows and clinics each year. Visitors are welcomed, but please drive slowly while on the farm. The farm does offer tours by appointment. 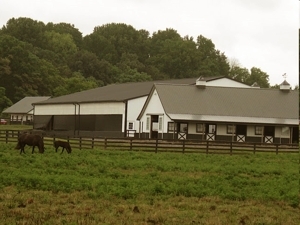 This farm is one of a number of well-known horse facilities in the tour area, and throughout Montgomery County. The horse industry in the county is certainly “alive and well”, continuing to adapt nicely to changing times in the farm/agricultural community. About one mile past the horse farm, on the left, you will see the entrance to the Naughty Pine Plantation (http://www.naughty-pine.com/), which provides an example of another current use of land previously more conventionally farmed. Here, Christmas trees, and a variety of ornamental landscaping trees are grown. Most Christmas trees are sold after cutting, but the ornamental trees are removed with balled roots, ready to be planted at a new location. This 340 acre tree farm has been in the operator’s family for about 25 years. Please do not enter the farm, except during the Christmas tree selling season. The dates when one might visit the farm to purchase a Christmas tree can be found on the farm website late in the fall. After driving just a few tenths of a mile, you will see the very picturesque Wish Upon a Ster Fresian horse farm on the left (yes, "ster" is how the word "star" is spelled in this location). This farm was begun in 2003, by the Feys family. There are usually a number of horses, including mares with their foals, easily seen in the front pastures. These horses are bred as pleasure and performance horses, frequently used as driving horses or as dressage horses. This farm does have regularly scheduled “open houses”, at which time visitors are welcomed. Please visit the farm website (www.wishuponaster.com) to see a listing of open houses, and of the horses on the farm. At the stop sign, where West Hunter Road intersects with MD Rt. 28, our travelers have another choice. By turning left (West), and driving a few tenths of a mile you will come two large parks, one on either side of the road. These two large parcels of land, totaling about 770 acres were donated through the generosity of Monica Greenberg, and the late Hermen Greenberg, and of the late William Rickman, Sr. Plans for the park include development as a public equestrian facility for Montgomery County. As of this writing, that planned development has not begun, although there are miles of beautiful and well-marked walking and horse bridle trails, waiting for you to enjoy them. These donations by the Greenberg’s and Dr. Rickman are an everlasting gift for the people of the county, and of the entire area. Further information on the parks, including trail maps, may be obtained by visiting (http://www.equestrianpark.org/home.htm). On the other hand, if we turn right (East) onto Md. Rt. 28 at the West Hunter Road stop sign, and drive about two miles, we come to Lewis Orchards, on the left. 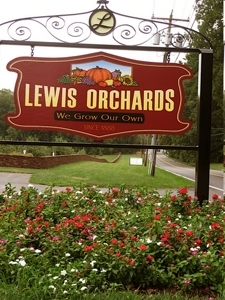 These orchards and the well-known farm market have been in operation for well over 100 years, all that time owned by descendants of the Lewis family. During the growing season, a wide variety of fruits and vegetables are available, along with flowers, pumpkins and dairy products. Also, there are impressive displays of canned goods, including jams, jellies, sauerkraut, pickles and honey. Please note the beautiful Market Building, completed in 2003, and the remarkable new stone wall, extending east along Md. Rt. 28 from the market. 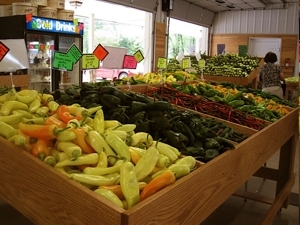 No country road trip would be complete without a stop at one of the farm markets, described above and below. 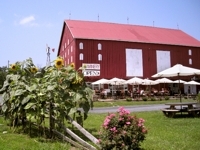 A visit to the Lewis Orchard website (www.lewisorchardfarmmarket.com) will inform the reader of products currently available. About ½ mile down (North) Peach Tree Road, the road seen just to the left of the Lewis building, on property that adjoins the Lewis Orchards, you will find another of the popular orchards/farm markets of the area. This 132 acre farm, which has been in the family for more than a century, supported a sizeable dairy herd, as well as the orchards, until just a few years ago. In fact, a number of cows still graze in a pasture next to the parking lot for the orchard sales pavilion. The beautifully-kept orchards are the pride of the Kingsbury family, and produce delicious peaches, and very memorable apples. A stop at this market will provide delightful memories. Cherry Glen Goat Farm is another very unique type of farming operation, on a farm only a few miles from the Kingsbury entrance. Because the farm is not open to the public, and cannot be easily seen from the road, driving directions are not included. The farm has bred and raised high quality milking goats for a number of years, goats to be shown in breed shows, and eventually sold throughout the country to other goat farmers. In the first decade of the new century, however, the Cherry Glen folks have concentrated more on actual milk production, milking as many as 150 goats, twice daily. All of the goat’s milk produced is processed into a delightful variety of goat cheese, which has become very popular in the Metropolitan area. Wouldn’t the farmers of past times be surprised to learn that a goat farm was thriving in the same neighborhood in which they milked cows for so long? A very informative website for the farm may be found at (http://cherryglenfarm.com/). After leaving Kingsbury’s Orchards, head return back up (South) on Peachtree Road to the intersection with Rt. 28. Turn left and drive the short distance to the crest of a hill. Before you lies Spring Valley, formerly the home of the nationally known Spring Valley Hereford Farm. The farm headquarters were located in the large complex of buildings down the hill on the left, but the farm occupied hundreds of acres, on both sides of the road. The farm produced high quality breeding stock of Polled Hereford beef cattle (red cow, white face, born with no horns), and held large sales at regular intervals. Owned for decades by the Rolfe family, the farm continued to operate until the late 1970’s, when it was sold, and converted into its present day use as a large horse farm. As you drive onward, again note the large grain fields on the right side of the road. In fields such as these, Montgomery County’s grain farmers’ still produce surprisingly large quantities of grain, especially corn and soy beans. Continue about 3 ½ miles to the intersection of Sugarland Road to the right, and White Grounds Road to the left. To the right (Sugarland) is Homestead Farm, to the left (White Grounds) is Susanna Farm. 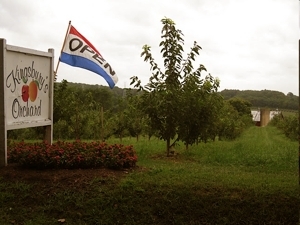 Homestead Farm is another of the delightful fruit and vegetable farms that abound in the area. This farm has been operated by the well-known Allnutt family for many years. A number of the fruits and vegetables grown at Homestead Farm can be obtained as “pick your own”, which really brings home the lesson of where our agricultural products come from. The farm is located about one mile down Sugarland Road, on the right. 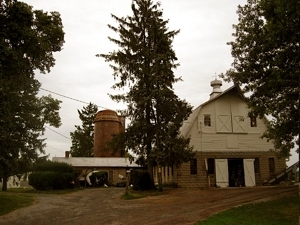 The farm is open in-season, so check the website for open hours at (http://www.homestead-farm.net/) before visiting. Our Farm Trail will continue to the left on White Grounds Road. After driving down White Grounds for just over a mile, on the left, you will see the entrance to Susanna Farm, a farm that raises and sells nursery stock, including “unusual conifers and dwarf Japanese Maples,” among many other types of shrubbery and trees. This farm does welcome visitors during scheduled hours of business. Just a short drive up the driveway will bring the traveler to a beautifully maintained property, with a large variety of very unique shrubbery and trees, easily seen. More information on this farm, another converted dairy farm, may be obtained at (http://www.susannafarmnursery.com/). It seems rather fitting that our rural driving trail end here, at the edge of bustling Germantown, at an old dairy barn that has been converted into a museum for the nearly-gone dairy industry of Montgomery County. Around it are not pastures, hay fields or corn cribs, but the huge Soccerplex, the beautiful new indoor swim center, and the Discovery SportsCenter, the home of the Washington Freedom woman’s professional soccer team. It is a good bet that no black and white cows will ever again graze on all that beautiful grass that you see here! This museum was opened in June 2010, and contains exhibits on dairy farming and the dairy industry that will help the viewer understand what all of those farm families did, in not so along ago times. Hours of operation will be somewhat limited, so please call ahead or check their website (http://www2.mooseum.com/) to insure that the “Mooseum” will be open when you arrive.